T.M.Soundararajan or more popularly known as T.M.S, a wonderful songer who contributed a lot for the growth of the Tamil Music Industry. A genius that he was, he has contributed for over an unimaginable six decades. His songs ofcourse are volumes. 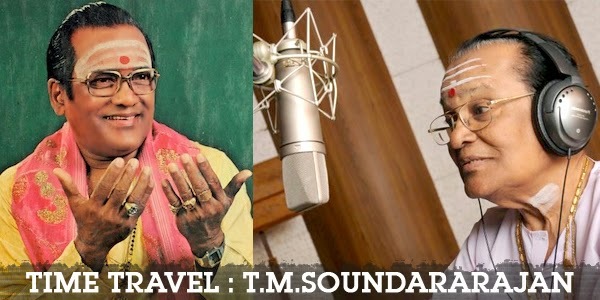 Unfortunately it was last year when T.M.Soundarajan passed away. It is a surprise that a singer like T.M.S was initially rejected by many composers after which he suddenly made an entry into the films with Krishna Vijayam, thanks to S.M.Subbaih Naidu. His collaborations knows no bounds and has been involved in all sorts of productions, right from the days of Thyagaraja Bhagavathar. T.M.S has won over a hundred awards and honors and infact one can say he completely deserves it all. ‘Naan Naanyitaal’ is enough to describe the mass attraction T.M.Soundararajan has created. Until today it created that the mass appeal and infact it can never be replaced. Similar is the case with the song ‘Adho andha paravai pola’. These are ofcourse his classics. Movies like Agathiyar, Shanti, Padagotti etc. were infact flocking with crowd, thanks to the hit songs T.M.S. gave in the movies. One thing admirable is that T.M.S worked with all composers on an equal note and infact when he worked with M.S.V and Ramamoorthy, he yet again delivered a lot of hits. Some of the hits would ofcourse include ‘Accham Enbadhu’ from the movie Mannadhi Mannan and ‘Aaru Maname aaru antha’ from the movie Andavan Kattalai. Another fun to listen song of T.M.S is ofcourse ‘Azhagiya Tamizh magal ival’ from Rickshawkaran, Engalukkum Kalam varum from the movie Pasamalar – which ofcourse is talked about till today for the beautiful affection shared between the brother and the sister. T.M.S has definitely left behind a huge history to talk about that is ofcourse never ending. Time to tune in to his best songs here.